Preheat oven according to crescent instructions. Butter skillet. 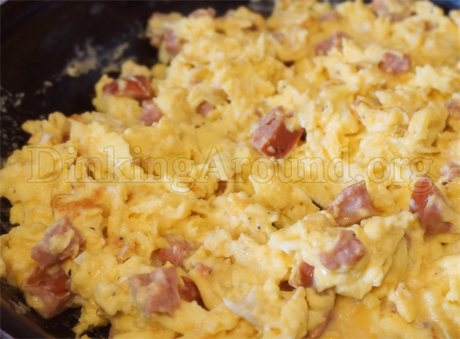 Scramble eggs with creamer, velveeta, and pepper. Press out crescents (I sometimes use 2 per roll, but, you can squeeze it into 1, as well.). I find it easier to press it out into larger triangle. Roll like taco, sides in first. Bake accordingly, until brown. *You can choose to add onions. Throw in jalapenos before rolling. Your favorite toppings. 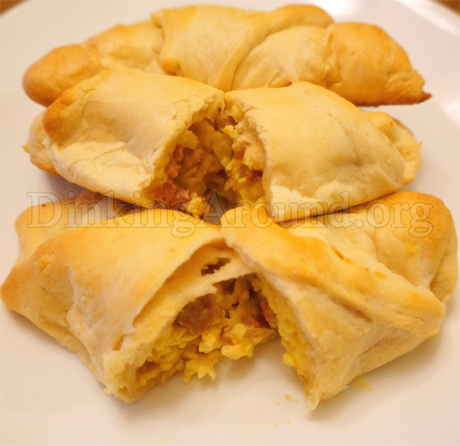 This entry was posted in Main Dish O' Food, Recipes and tagged breakfast, cheesy, crescent, easy, egg rolls, eggs, moons. Bookmark the permalink. EarAche Gone in a DAY! 2 Kids Tested, Mom Approved! For Recipe Click Here -MANY Faces of Quesadillas – 10 DIFFERENT RECIPES!!! For Recipe Click Here – Perfectly Cooked Chicken – Non-Grill – 30 minutes! For Recipe Click Here – Mahalo! Hawaiian Pasta Salad – It’s Grindz! For Recipe Click Here – tTt’s Stuffed Taters – With Homemade Bean Recipe! For Recipe Click Here – Tay’s Sweet N Spicy Salsa – Jalapeno! For Recipe Click Here – Healthified Cheesy Basas (Cheesy Kielbasa N Cabbage) – Do Search for MORE Egg Roll, Cabbage Roll, Wrap Recipes! For Recipe Click Here – Fungi Soup (Mushroom Soup) – Only Soup a Fun Guy can Get a Life and Grow Up! For Recipe Click Here – Toscana O’Man-Ah! Soup – Nice kick to it! For Recipe Click Here – Low Carb Taco Cass.